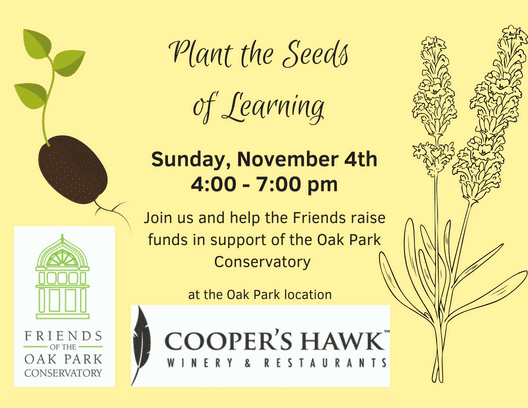 Cooper’s Hawk November 4th – Join Us! Sip on selected wines that are paired with appetizers and bid farewell to Daylight Savings time. Come find out about some of the educational programs we provide to children in our community. Invite your friends and introduce them to our cause. Do you know about our Exploration Kit? This school year, the theme is Plant Super-Powers! We lend it out to D97 teachers for FREE. Kids learn about leaves of plants that have structural ‘Super-Powers’ which enable them to thrive in their habitats. Do you know about the school field trip tours we give to D97 elementary schools for FREE and for other districts for a small fee? These are 45 minute tours run by Friends docents. We now provide tours to pre-schoolers as well! Cannot make it? Consider making a small donation to the Friends.